One of the unfortunate side effects of aging is hair loss. This presents as male pattern baldness, alopecia, or a general thinning of the hair. The main cause of hair loss? Hormones. Your hormones regulate hair growth, as well as other functions within the body. And as we tack on the years, well… hormone levels start to deplete. Senara Men’s Health Center in Peoria, IL offers several holistic treatment options to restore hair growth. In addition to correcting hormone levels (check out our Hormone Therapies here), we treat hair loss at the scalp with PRP injections and ThermaDome® laser therapy. All natural, drug-free, and minimally invasive, as it should be. Hair loss affects over 1.5 billion people worldwide, including more than 80 million in the U.S. alone. Hair loss doesn’t have to define who you are. 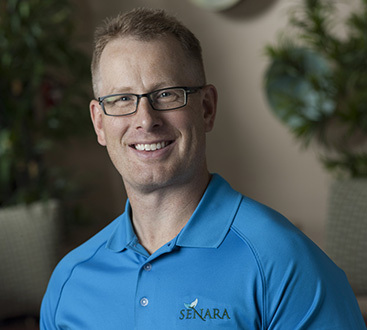 Schedule a consult with one of Senara’s physicians today to learn more about your options. Call (309) 245-1995 or request an appointment online. Platelet-rich plasma (PRP) is an effective treatment option to stimulate the regrowth of hair, naturally. PRP is derived from blood and contains the essential growth factors and proteins that stimulate healing and cell regeneration. Using a small amount of your own blood, a centrifuge is used to separate the platelet-rich plasma from the rest of the blood components. A small needle is used to draw the PRP out of the tube and it is then injected into the targeted treatment area – the areas of your scalp where hair loss has occurred. PRP Hair Restoration Therapy is minimally invasive, virtually pain-free, and has almost no reported side effects. By using your body’s own healing mechanisms, new hair growth is stimulated. The result is thicker, stronger, and denser hair. Treatment is usually performed once a month for three months in the beginning. After the initial round of injections, follow-up treatments will occur about four times a year for up to two years. Your personal treatment protocol may vary based on the amount of hair loss, type of hair loss, genetic make-up, and age. After the first cycle of treatments, many patients will see up to a 40% improvement in hair regrowth at the treatment site. Research on the effectiveness of PRP for hair restoration is still in the early stages but shows a lot of promise.